Aventurine Blends combine the indulgence of Aventurine Glass Tiles with the timeless Classic Series, creating eight superb glass tile blends that add a balanced yet appealing look to any surface. With the mix of palettes from blues and whites, browns and tans, blacks, reds and purple, you’ll find a pleasing, eye-catching blend to compliment any décor. Choose from a glass tile palette of translucent and opaque colors in beautiful, nature-inspired shades to bring a stylish and revitalizing look to a variety of surfaces, such as walls, countertops, backsplashes, light residential floors and pools. 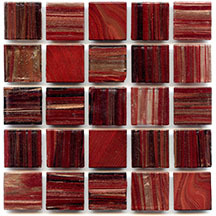 Subtle shade variations within each sheet are inherent as part of the character and unique beauty of this glass tile line. You can also use our online custom blend tool and custom gradient tool to create, price and order your own glass tile designs!